The patient was a 60 year old man from the central Karoo. He had apparently been unwell for two weeks. A history of trauma to the head was not obtained. On arrival at Groote Schuur Hospital he was comatose with fixed pupils, the right slightly larger than the left. 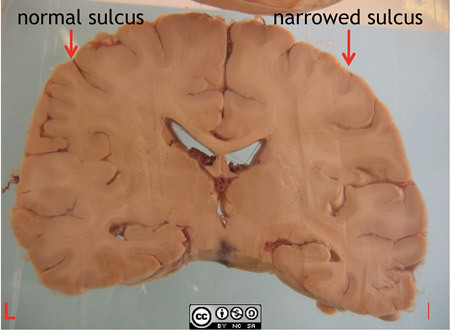 A CT scan of the head showed a 20mm low density right-sided subdural collection, with an 18mm shift to the left. A chronic right sided subdural haematoma was evacuated via a right frontal burr hole. His level of consciousness improved slightly but temporarily, and he died of an aspiration pneumonia. 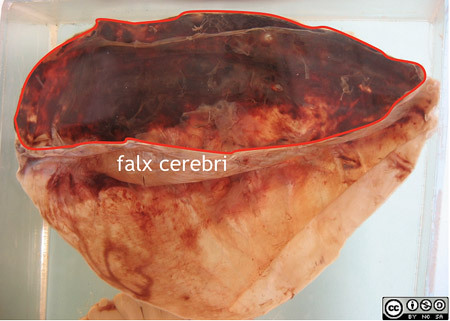 This part of the specimen is the dura of the fronto-parietal region which has been stripped from the upper half of the skull. The inner surface shows residual organising subdural haematoma, extending over the whole surface of the right hemisphere. A sealed burr hole opening can be seen on the right hand edge of the dura. 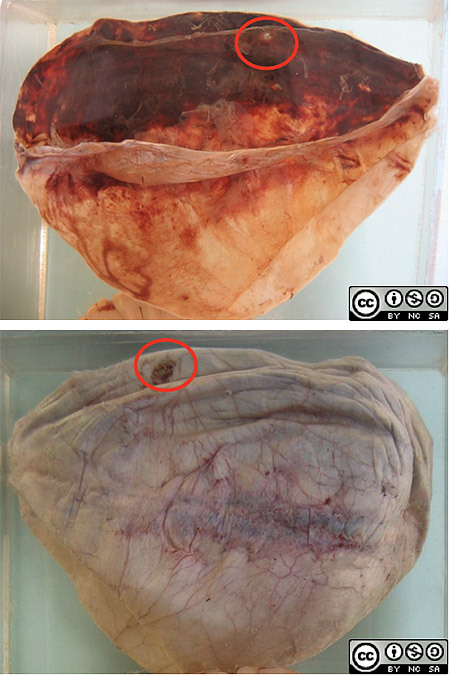 Microscopy revealed attempted organisation of the haematoma with loose, fibrous, vascularised membrane enclosing two layers of haemorrhage, suggesting that the haematoma increased in size over time due to repeated haemorrhage. There is a potential space between the dura and arachnoid. 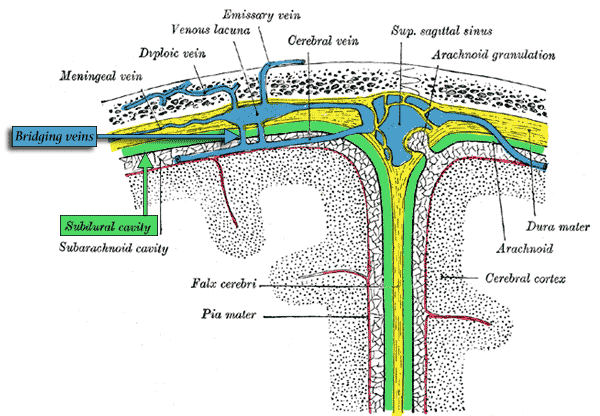 Bridging veins cross from the surface of the cerebral convexities through the subdural space to empty into venous sinuses in the dura, and ultimately into the superior saggital sinus. These vessels are prone to tearing, especially in infants and in the elderly (in whom brain atrophy causes a widening of the subdural space so that bridging veins are stretched out). Subdural haematomas begin to organise within two weeks, but re-bleeding is common due to the fragility of vessels in the granulation tissue. 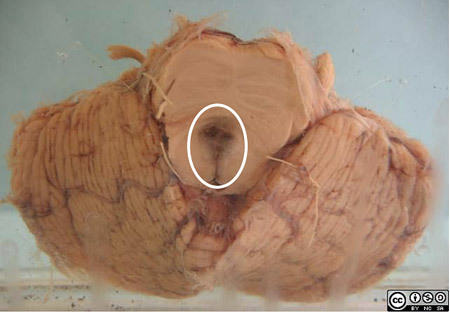 This coronal slice from the same patient shows swelling of the right hemisphere, with slight compression of the right lateral ventricle. 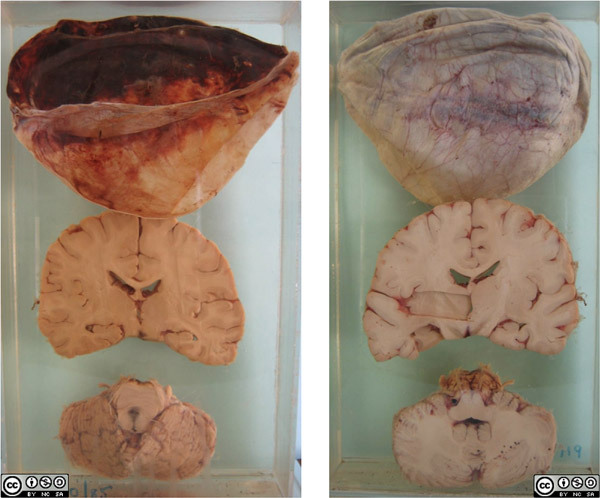 There is a midline midbrain haemorrhage, a consequence of raised intracranial pressure and caudal shift of the midbrain, with overstretching of the perforating branches of the basilar artery. The midbrain haemorrhage explains the limited improvement following drainage of the subdural haematoma in this patient.